CAMPBELL, Calif., July 11, 2017 /PRNewswire/ -- Jive Software, part of the Aurea family of customer experience solutions, today announced that Truth Initiative®, a national public health organization inspiring tobacco-free lives, has adopted Jive's industry-leading community software to deepen its impact with smokers and ex-smokers. Since launching the revamped BecomeAnEX® community with Jive's advanced capabilities for digital peer-to-peer support earlier this year, the organization has increased member engagement by 20 percent and accelerated its mission to help more people quit smoking. Truth Initiative is America's largest non-profit dedicated to achieving a culture where all youth and young adults reject the leading cause of preventable death: tobacco. One of the organization's primary programs, BecomeAnEX, was launched in collaboration with the Mayo Clinic in 2008 to help smokers re-learn life without cigarettes. Federally-funded research studies have shown that smokers who follow the EX® plan have a four times greater than average chance of quitting, and that the program's vibrant community is an important driver of success. More recently, Truth Initiative added the EX Program, an expanded version designed for use by employers, payers and institutions, to promote smoking cessation at the enterprise level. "Our research shows that online interventions where smokers connect with experts and peers are as effective as face-to-face interventions, but at far lower costs," said Dr. Amanda Graham, senior vice president of innovations at Truth Initiative and head of the EX Program. 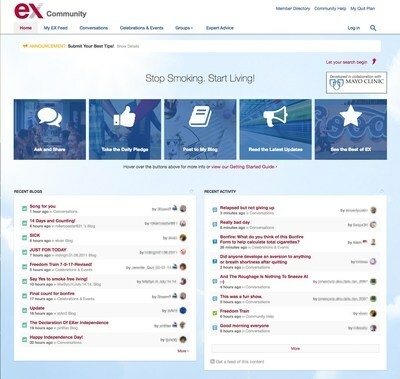 "As we established our vision and multi-year roadmap for expanding the proven BecomeAnEX program, we knew it was time to upgrade to a community solution that could help us significantly grow user engagement, support platform extensions and deliver critical analytics on the role our online community plays in smoking cessation. After a rigorous selection process, we determined that Jive's rich feature set and intuitive user-centric interface were best suited to our needs—including capabilities for new member on-boarding, community participation and celebrations, as well as robust community management and advanced analytics." Truth Initiative worked with 7Summits, a longtime Jive partner and leading social business solutions provider, to keep members' needs and convenience at the forefront during the transition. 7Summits helped design the new community and ensure the seamless migration of over one million records from the previous BecomeAnEX platform. The community's longstanding members are now thriving on Jive and helping to increase engagement amongst new members by promoting norms around cessation and providing practical tips, strategies and encouragement. Jive gives EX members more ways to easily express themselves, find the content that matters most, celebrate milestones and connect with each other. In the four months since moving to Jive, nearly 8,500 new members have joined Truth Initiative's EX Community. These new members are 32 percent more likely to contribute on their first day, ensuring they will stay engaged with EX for a longer period of time. Overall activity has also increased, with the total number of posts and comments up roughly 20 percent compared to the same period one year ago—thanks to greater visibility of the content and easier member interactions on Jive. Such increases in community engagement have a powerful impact on the Truth Initiative mission, as peer-to-peer support can be the most critical element of the quit process. "It is especially inspiring to observe the power of connection when it comes to cause-based communities like Truth Initiative's award-winning EX Community," said Robert Block, chief customer success officer at Jive Software. "There's no better gratification than seeing collaboration technology used for the greater good—in this case by connecting people from all walks of life, and giving them easy ways to share information and cheer each other on during their difficult journeys towards getting and staying healthy." Truth Initiative joins a long list of nonprofit organizations, charities and foundations around the world that rely on the Jive platform—including the Annie E. Casey Foundation, Easter Seals, Inc., Lutheran Immigration & Refugee Service and PACT. Jive helps these organizations connect geographically dispersed members, gather and disseminate cause-related information, mobilize mission-critical resources and drive deeper engagement and dialogue with donors, volunteers and consumers. Jive Software, part of the Aurea family of customer experience solutions, is the leader in accelerating workplace digital transformation for organizations, enabling people to work better together. The company provides industry-leading Interactive Intranet and Customer Community solutions that connect people, information and ideas to help businesses outpace their competitors. With more than 30 million users worldwide and customers in virtually every industry, Jive is consistently recognized as a leader by top analyst firms, including Gartner Inc., Ovum and Aragon Research. More information can be found at www.jivesoftware.com or the Jive Blog.